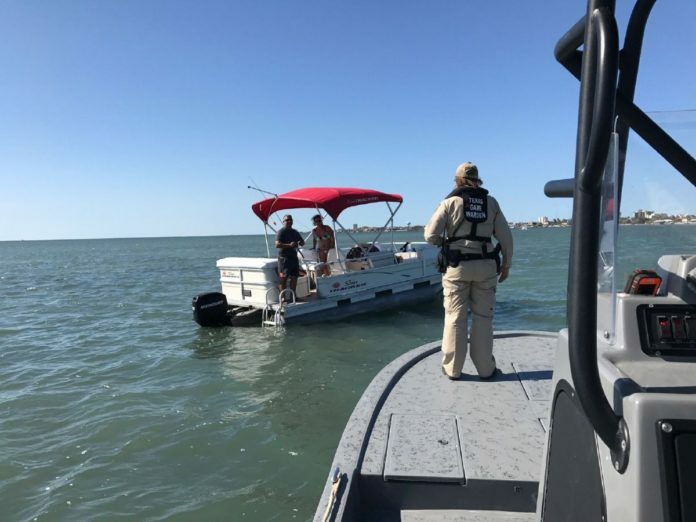 Game Warden Kryssie Thompson calls out "Game Warden" as the game warden's boat approaches boaters to conduct a safety check in the Laguna Madre on Thursday, May 25, 2017. SOUTH PADRE ISLAND — The game wardens approached the anglers in the bay Thursday. With a couple cracked Miller Lites in their boat, a man and a woman reeled in their lines. “Game Warden!” Kryssie Thompson announced as the Texas Game Warden boat approached. The wardens routinely check boaters around the island, often on weekends, especially this Memorial Day Weekend. They sometimes go out on weekdays or at night, as well. Thompson and Jarret Barker ran through the safety check with the fishers, who were aboard a pontoon boat in the bay not too far out from restaurant Pier 19. Life jackets? Check. Horn or whistle? Check. Throwable? Check. Fire extinguisher? “This one might be no good, so we have a backup just in case,” the man said. He had a usable backup fire extinguisher on board. The wardens thanked the two and moved on. “If you can get the job done by education, that’s what I do,” Thompson said. “We’re just looking for compliance,” Barker said. Alcohol is acceptable, in moderation, Barker said. Nothing about the fishers’ alcohol consumption struck the wardens. They told the anglers to be careful, and the fishers agreed. The penalty for not having some of these items is a Class C misdemeanor, Barker said. Barker told stories of boating accidents, especially in the last month. A person was texting while driving his boat and ran into one of about 100 unlit markers in the water. He was not injured, but not everyone is as lucky. Another person died from a similar accident — running into a marker — last month, Barker said. But it’s all about safety, not getting boaters for tic-tac penalties. Barker enjoys when everyone has all the items they’re supposed to have.